How To Catch the Vintage Watch Bug—Without Breaking the Bank | Skinner Inc. 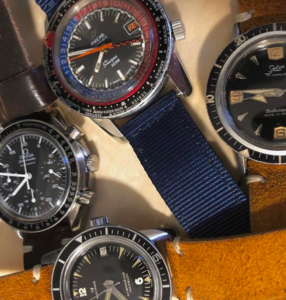 Collecting of any kind is fueled by a passion for design, quality, history, or by some unquantified pulse, and mechanical watches have a beauty, history, and utility that their owners can relate to on many different levels. To start collecting, focus on what speaks to you, what you appreciate visually, mechanically, or for the history that these pieces offer. Pictured are a 38mm Selza dive watch with a 17-jewel AS 1361N automatic movement, and a 1960’s Miconos “Blancpain-style” dive watch. Both watches tend to fall in the sub-$600 range. Rounding out the quartet was an Omega 3510.50 Speedmaster Reduced and an Enicar Sherpa Guide Mark III. Both are in the sub-$2,000 range but continue to climb in interest and price. I strongly suggest doing your research, investigating, learning the signs of authenticity, and speaking with other watch enthusiasts about the ins and outs of each model and maker—for example, Omega Speedmaster reference 2915s—there were three versions, but the differences between them could break the bank! When tracking sales and researching online purchases, remember that what may seem an easy prize is often just the opposite. Look for small brand names outside the big known Swiss companies. Zodiac, Tradition, Wyler, and Titus are just a few. Some brands that you might not recognize actually teamed up with major brands such as Heuer to produce some very underrated pieces back in the mid 20th century. Zodiac produced some of the best dial configurations in their Sea Wolf and Aerospace GMT models with vibrant Bakelite bezels and wonderful sharp angled hands. For many, the dial layout and balance is certainly a big draw on what sells a watch but don’t let the dial sell it alone. You should be looking for a manual wind watch that beats at 18000 BPH and seventeen jewels as a minimum. There are some very interesting pieces in the upcoming sale such as a Wakemann Chronograph or a Hamilton Chrono-diver or “Big-eye” chronograph. If calendar watches are your thing and a Patek Philippe is out of your budget take a look at an Omega reference 2606 or a Movado triple calendar. We cannot forget about the traditional dress watches but that is for another time. Skinner’s watch offerings have always included a wide variety of makers and estimates—from world record prices for the Tornek Rayville TR900 dive watch to a Patek Philippe 3970E, Cartier Two-tone “Panthere” 1120, to a 1960s Lemania stainless steel triple-register chronograph. Worth is based on who, what, when, and why, and as each new trend takes hold, the arena also changes. We are proud to offer a range of items for the discerning collector, student, or novice. As the issues around value and worth seem limitless, and as collectors and sellers, we hope to continue the conversation. Learn about Clocks, Watches & Scientific Instruments at Skinner. To contact a department specialist, email clocks@skinnerinc.com or call 508-970-3201. This entry was posted in Blog and tagged antique watches, dive watch, fine watch, vintage watch by Jonathan Dowling. Bookmark the permalink.